All passengers aboard Air Niugini Flight 72 survived Friday after the pilot missed the runway and the plane crashed into the sea off a small island in Micronesia. The Boeing 737 was set to land at the Chuuk International Airport in Weno, the main island of the State of Chuuk in the Federated States of Micronesia, but “landed short” of runway while, an Air Nuigini statement said. 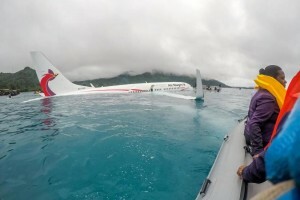 The aircraft was operating a scheduled flight between Pohnpei and Chuuk Airport when the accident occurred Friday morning. “The weather was very poor with heavy rain, and reduced visibility at the time of the incident,” the airline said. The Papua New Guinea airline said all 47 on board — 35 passengers and 12 crew members — survived. Air Niugini has scheduled a special flight for company personnel to take airline management to provide assistance to passengers and crew. “This will include the company doctor to assist with treatment of few passengers who had injuries from the incident,” the airline said.